Elon Musk scoffs at the idea of Fuel Cell Vehicles (FCVs) but I believe this is one area he is getting it wrong because Hydrogen is the energy source of the future. Toyota recently announced the launch of their new FCV sedan in Japan. It will be available for sale by April 2015. The car, known as the Toyota Mirai, has a driving range of over 700 km (430 miles) on just two bullet-proof 70 MPa tanks that have a combined total capacity of about 5 kg of compressed hydrogen at 5.7 wt% (better than DOE 2017 target of 5.5 wt%). With a top speed of 170 km/h (106 mph), it can do 0-60 mph in 10 seconds and unlike Electric vehicles that take hours to fully charge, Toyota’s FCV needs only 3 minutes for a complete refill. It also has no engine or transmission (gear box), just one 90 KW electric motor. 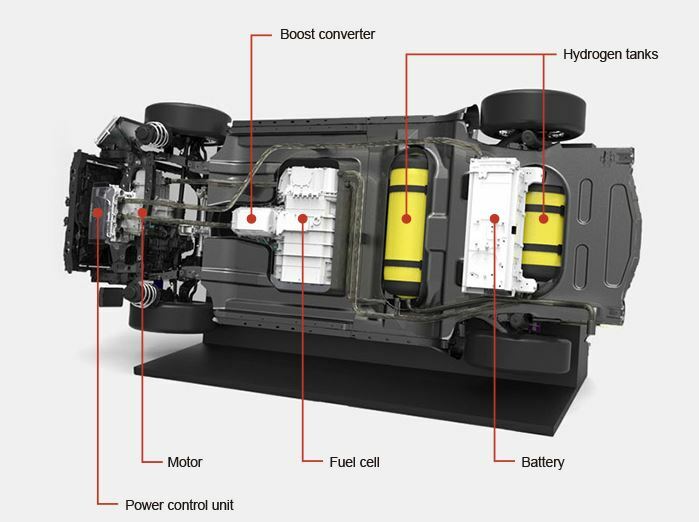 With a fuel cell energy density of 3.1 KW/L & 2 KW/kg, the car produces a maximum 100 KW of power and can be connected directly to your home for on-demand electrical power generation, providing enough energy to last a typical home 7 days (based on energy needs of 10 KWh per day). It also has an auxiliary 20 KW lithium-ion battery and can start without any problems at temperatures as low as -30ºC (-22ºF). The Polymer Electrolyte fuel cell which looks like it weighs about 50 kg (110 pounds) is quite impressive coz Toyota has managed to bring down the cost to 5% that of prototypes of the past decade, from $1 million to only $20 thousand, and it also lacks the humidifier found in all of today’s fuel cells, thereby allowing a further reduction in cost & size. The total fuel tank volume of 152 liters takes up quite a bit of space but we hope that with advancements in Hydrogen storage tanks, such as metal hydrides, we shall soon have smaller tanks containing the same amount of hydrogen by weight. Another way they managed to reduce the cost is by reducing the amount of platinum in the fuel cell from 100 grams to 30 grams. 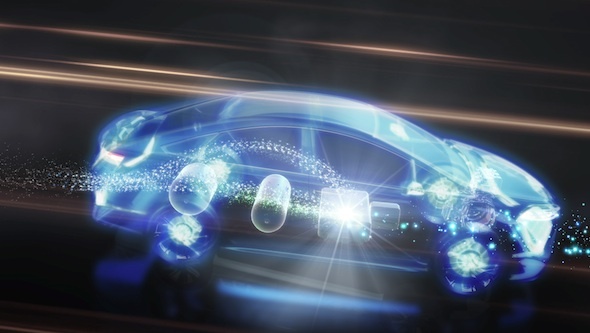 They used technology licensed from the US DoE that enables the use of a new catalyst that’s more active, more stable, and more durable, than platinum. At $60,000, the price of the car may, however, be rather prohibitive. One of the problems of FCVs that everybody mentions is the lack of refueling infrastructure. This really is no problem at all the way I see it. The popularity of FCVs & the increase in demand for hydrogen in general will naturally lead to a proliferation of the fuel stations without much effort. This is after all how capitalism works. Where there is demand, an entrepreneur will provide the supply. Consider for example the fact that within about 20 years the United States went from 0 gas stations to over 300,000 by 1929 due to the popularity of the Ford Model T? Hopefully this gallant effort by Toyota will lead us a step closer to the Hydrogen Energy Revolution. You can find more info below. This entry was posted in Uncategorized and tagged Elon Musk, Fuel Cell, Hydrogen, Mirai, Toyota. Bookmark the permalink.